Wheaton Hills Civic Association is a non-partisan neighborhood organization dedicated to representing the interests of homeowners and residents residing within the Wheaton Hills neighborhood. We are an organization within which homeowners and residents can come together to acquire and disseminate information and support each other in our common goal of enhancing the quality of life in our community. Preserve and enhance the quality of life for the members of the Wheaton Hills Civic Association. Promote community engagement and provide activities to bring Wheaton Hills Civic Association members together. Serve as a liaison between the Wheaton Hills Civic Association members and our elected officials and county department heads. Coordinate and amplify the civic voice and ensure resident participation in shaping the future of the Wheaton Hills Civic Association and surrounding areas. 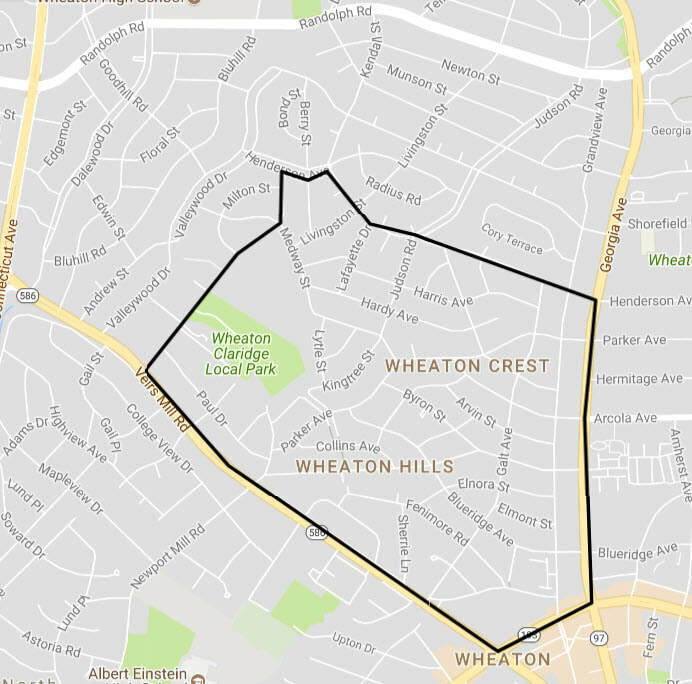 Keep the area within the Wheaton Hills Civic Association boundaries a livable and safe community. Continue to build a bright future for the place we call home. WHCA is generally bounded by Veirs Mill Rd., University Blvd. W, Georgia Ave., Henderson Ave., and Claridge Rd. If you live within these boundaries, you are a member of WHCA! Join as an Active Member to receive updates and an enhanced level of member entitlements.